Mugo Pines are small, round or broad pyramidal evergreen shrubs growing to around 4' — 10' tall. The mugo pines grow best in full sun, but can tolerate light shade. Prefers moist loamy-type soil. Originally from alpine regions in Europe. The dark green, 1" — 2" long needles are stiff. 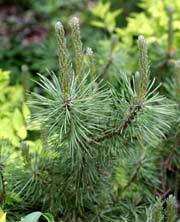 The stout, dark green needles are borne in bundles of two and grow densely on the branch, often remaining green for up to 6 years before turning brown and dropping, making this one of the more dense Pines suitable for a screen planting. Most other Pines are not suited for screens since they loose their inner needles and lower branches as they grow older. Since there seems to be great variability in height among individual trees, select nursery plants which have the form which you desire. Mugo pines are not a favored selection for homeowners due to the unpredictable growth rate, size and shape. However, in a free-form type landscape, the pinus mugo can be a dramatic accent plant that requires little pruning. When selecting a Mugo Pine to grow into a tree, choose one with a central leader; if looking for a more dwarf type Mugo Pine choose among the many compact selections.